There are many things that we still do not know about dinosaurs. The evidence of their fossil remains is often confusing, and some features can be interpreted in more than one way. But every time a new fossil is found, it adds another piece to the jigsaw. Gradually, piece by piece, we are building up a complete picture of how these astonishing animals lived and died. Q Who discovered the first dinosaur? A There are accounts of giant fossilized bones in ancient Chinese, Greek, and Roman texts. The Chinese believed they were the bones of dragons, and they were not far wrong. The first picture of a dinosaur bone appeared in 1676, in a book by Dr. Robert Plot, an English historian. He assumed it was the thighbone of an elephant. Q How fast did dinosaurs move? A Meat-eating theropods like Albertosaurus stood on their hind legs, and their leg bones show that they had a long stride like a modern ostrich. The muscle scars on their bones also show that they had an ostrichlike running action, so they could probably run quite fast— at least in short bursts. 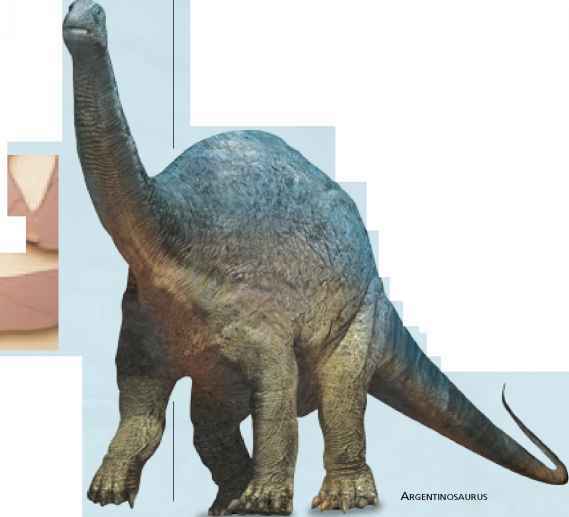 Big sauropods that stood on four feet, such as Argentinosaurus, would have moved more slowly. Q What was the first named dinosaur? A In 1824 the geologist and fossil hunter William Buckland published a scientific account of the partial remains of a large meat-eating reptile, which he had discovered near Oxford, England, five years earlier. 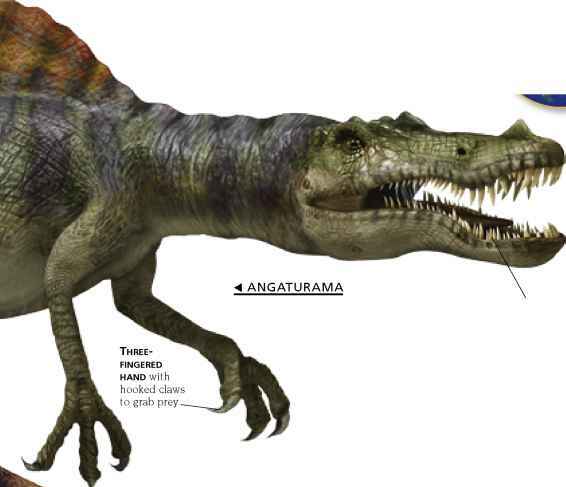 He named it Megalosaurus, which simply means "big reptile." Q How many different dinosaurs were there? A Nobody knows. About a thousand species have been found and named, but many more probably await discovery. Some fossils of the same species may also have been given different names. Q How intelligent were dinosaurs? A We can only guess at a dinosaur's intelligence by comparing the size of its brain with its body size. This suggests that hunters like Albertosaurus were a lot more intelligent than giant plant-eaters. They needed to be, to plan their hunting tactics. Q What was the biggest dinosaur? A Some enormous spine bones found in Argentina in the late 1980s were over 5 ft (1.5 m) across. They belonged to Argentinosaurus, a colossal sauropod that could have been 130 ft (40 m) long— although a complete skeleton has yet to be found. Q What was the smallest dinosaur? A The smallest dinosaur discovered so far is Microraptor, a birdlike hunter that was just 30 in (77 cm) long from its nose to the tip of its long tail. Found in China in 2001 and 2002, its fossils show the impressions of long feathers on its limbs, suggesting that it could glide through the air. Q Did dinosaurs make sounds? A Some dinosaur skulls have big, bony crests that may have been used to make noises. The crest of Parasaurolophus was linked to its nostrils, and by blowing air through it, scientists have produced a trumpeting sound like that of an elephant. Q How do paleontologists know where to look? A Dinosaur fossils have been found all over the world. Many have been discovered by accident, but the geology of each site often suggests where other fossils may lie. The most productive rocks are those that formed on land or in shallow fresh water, because dinosaurs were land-dwelling animals. 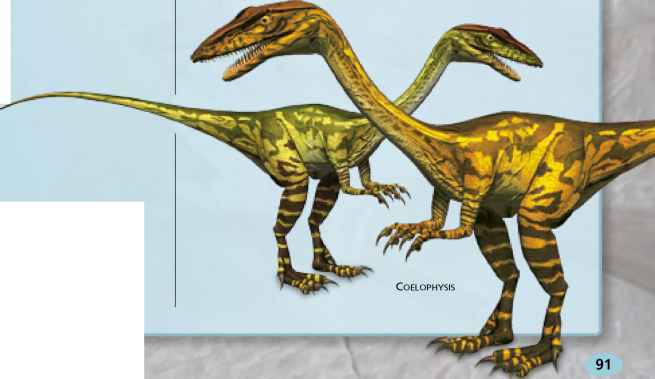 Q What was dinosaur skin like? A Some rare dinosaur fossils include impressions of the animal's skin. They show that many dinosaurs were scaly, like modern reptiles, but some, like Velociraptor, seem to have been partly covered in feathers or down—possibly for insulation. Q Were dinosaurs warm- or cold-blooded? A Giant plant-eaters were probably cold-blooded like modern reptiles. Small meat-eaters could have been warm-blooded, like birds, since this would make them more agile. Insulating feathers would help them conserve heat. Q Can you tell if a dinosaur is male or female? A The skulls of some herd-living dinosaurs such as Protoceratops are of two types. Some are larger and more elaborate and probably belonged to males that competed for females, just like stags with their large antlers. Q Why are smoothed stones sometimes found with dinosaur bones? A Many plant-eating dinosaurs swallowed stones (gastroliths) deliberately. 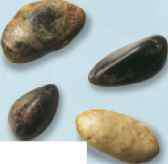 The stones settled in a muscular stomach, or gizzard, where they were ground together to mash the tough plant fiber to a pulp, becoming polished in the process. Chickens swallow grit for the same reason. Q How long did a dinosaur live? A A big, slow, cold-blooded sauropod may have had a maximum lifespan of about 200 years, but a fast-living, warm-blooded hunter would have died much younger. In practice, few dinosaurs would have died of old age. Disease, injury, or hungry predators got them first. Q What color were dinosaurs? A Dinosaurs were once portrayed in drab greens and browns, but they could have been brightly patterned. The males, in particular, may have sported vivid courtship colors, just like many male birds today. Females of smaller species were more likely to be well camouflaged. 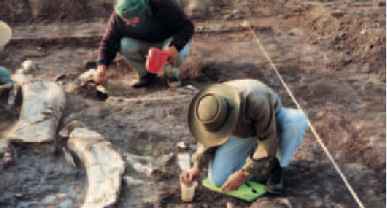 How do fossil hunters know the same dinosaur bones discovered belng to the dsme species?